(Kitco News) – World stock markets were mostly weaker overnight and U.S. stock indexes are also pointed toward modestly lower openings when the New York day session begins. 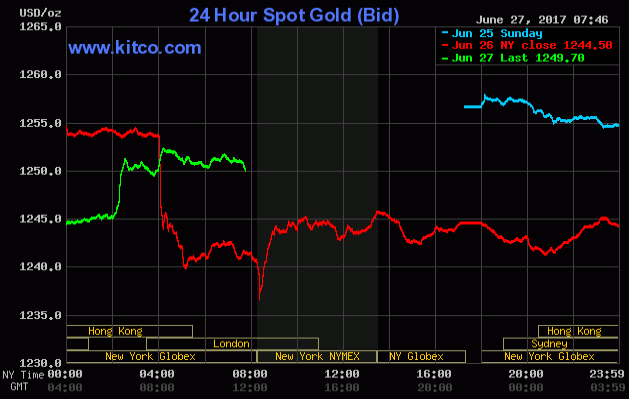 Gold prices are seeing a short-covering bounce with moderate gains Tuesday after prices hit a five-week low on Monday. In overnight news, European Central Bank President Mario Draghi said at a conference in Portugal the ECB will not be in a hurry to wind down its accommodative monetary policy because the European Union's collective economy is still in recovery mode. However, he also said the Eurozone economy is growing "above trend" and said inflation will increase at some point down the road, which will prompt the ECB to tighten its monetary policy. Draghi's overall upbeat comments on the Eurozone lifted the euro currency and sent European bond yields higher. Fed Chair Janet Yellen is scheduled to make a speech in London Tuesday, where she may remark on the U.S. economy and Fed monetary policy. The key "outside markets" on Tuesday morning see Nymex crude oil futures prices firmer on more short covering after hitting a 14-month low last week. The oil market bears still have the solid overall near-term technical advantage as prices are trading below $44.00 a barrel. Meantime, the U.S. dollar index is solidly lower early today. The greenback bears have the overall near-term technical advantage. U.S. economic data due for release Tuesday includes the weekly Johnson Redbook and Goldman Sachs retail sales reports, the S&P/Case-Shiller home price index, the consumer confidence index, and the Richmond Fed business survey.